She’s been called a powerhouse. As curator of consumer connections, her brand is brand – engagement, communications and culture. Her enterprise, PMM, is retained to build, position and protect some of the world’s most recognized brands as agency of record (AOR) to its Fortune 100, government agencies and influencer clientele. As Chief Executive Officer of PMM, Kimberly Blackwell is heralded as one of the country’s top executives in marketing and advertising. As a thought leader, she’s appeared in Fortune magazine, contributed on HuffPost Live, featured in Inc. magazine and captured on the covers of business trades. 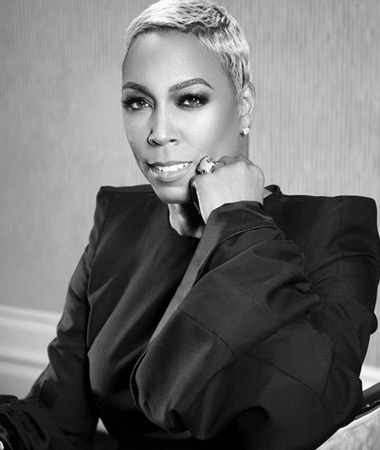 As an industry expert, she’s been saluted among leaders of the smartest companies as a 2017 Business First C-Suite Award honoree, celebrated in the midst of the nation’s “2017 Most Powerful Women in Business” by Black Enterprise, named PR News’ “2017 Top Women in PR”, and honored as an EBONY POWER 100.Blackwell is also a founding member of Legacy Acquisition Corp. where she serves as an advisor to the recently listed NYSE (NYSE: LGC.U) publicly traded company. Widely regarded for her industry expertise and trajectory of the multimillion-dollar female business enterprise, since 2011, Blackwell currently serves as one of the country’s eight female CEOs, on the National Women’s Business Council (NWBC). NWBC is a non-partisan federal advisory council serving as a source of independent counsel to the President of the United States, Congress, and the SBA on economic issues of importance to women business owners. With offices in the Midwest and Southeast, Blackwell’s companies include PMM Agency, PMM Promotions, PMM Sports & Entertainment, PMM Productions and PMM Media. No stranger to the White House, board rooms, lecture circuit or a whiteboard challenge, Blackwell and her nationally award-winning agency, PMM, have earned a reputation as a trusted brand manager. Representing Fortune 100 multibillion-dollar interests of global corporations that include the automotive, insurance and financial services, shipping and logistics along with government agencies, Blackwell and PMM have developed an identity for industry expertise and value in effective both B-to-C and B-to-B business solutions. Technical, strategic and a creative consultant to the C-Suite for marketing, brand and change management, organizational effectiveness, communication, public affairs, cultural transformation and inclusion, Blackwell is also a certified diversity professional of Cornell University. She has also completed executive training at Dartmouth, Northwestern and Harvard Universities. Blackwell is a member of the Executive Leadership Council (ELC), a network of the nation’s most influential African American executives. She also is a member of the Women Presidents’ Organization (WPO), and lifetime member of the National Black MBA Association®. Grateful in the journey, Blackwell subscribes to the belief “to whom much is given, much is required.” She leads from governance positions, serving as a board member and trustee for affiliates of the Chamber of Commerce (Columbus, Ohio), Executive Committee member of the YWCA Columbus and Vice-Chair of Columbus Urban League. In 2017, Blackwell served as Chair the American Heart Association Great Rivers, “Go Red for Women” campaign. A Buckeye native with Atlanta residence, Blackwell is a member of Alpha Kappa Alpha Sorority, Inc. A Chancellor’s Citation recipient, with blood that proudly bleeds orange, Blackwell holds a bachelor’s degree from Syracuse University. Blackwell also has earned a master’s degree from Xavier University (Ohio), where she also once served as an adjunct professor for nearly ten years.